NAPLES ARCHITECTURAL AND DESIGN STYLE IS CHANGING. Gone are the Mediterranean castles that once were featured on every corner. Today a fresh, clean, simpler style dominates the Naples new construction marketplace. Influenced by British West Indies architecture, today’s new homes are serene and sophisticated, with an understated elegance. Calusa Bay Design has captured this trend beautifully, interpreting the fresh, breezy, coastal style that homeowners today want into their own blend of coastal chic design. Calusa Bay Design is not your typical Naples design firm. The company was born out of the Developer’s need for beautiful, tasteful, coastal interiors to perfectly complement the multi-million dollar homes for which Calusa Bay Development is known. And complement these homes they have, influencing all aspects of the home’s design from start to finish. 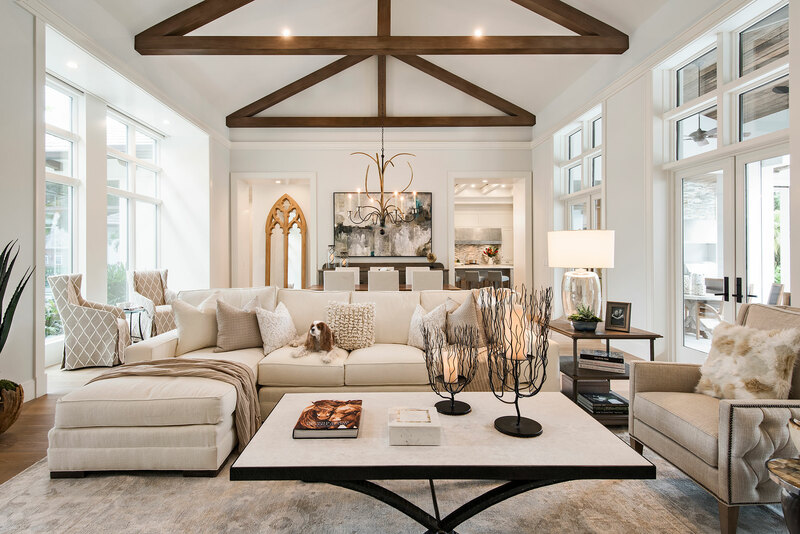 With a hand in everything from collaborating on architectural plans, to specifying interior and exterior finishes, trim, and flooring, to designing cabinetry, scaling furniture and specifying stonework…make no mistake, Calusa Bay Design knows how to turn out a spectacular home. Principal Leslie Sherman is credited with numerous multimillion dollar homes along Naples Gold Coast. Working on only a few homes a year, her signature style clearly stands out. ABOVE: A stunning, organic Great Room bathed in natural light. “My goal is to create beautiful and unique homes, designed for living.” says Sherman. “I have an amazing, talented team whose passion is to create simply fabulous homes”. Key to Sherman’s team is general contractor Matt Knauf, Knauf Koenig Group. The pair has worked together on all of Sherman’s new construction projects. Although each home is unique, her homes all bear a striking architectural similarity, a rustic contemporary style that is both unique and refreshing. Design Director Debra Lysy and Interior Designer Tatum Johansson create the stunning interiors in Sherman’s homes. Years of design experience combined with excellent taste and unwavering attention to detail have produced a trail of satisfied clients, and 2017 promises more of the same. 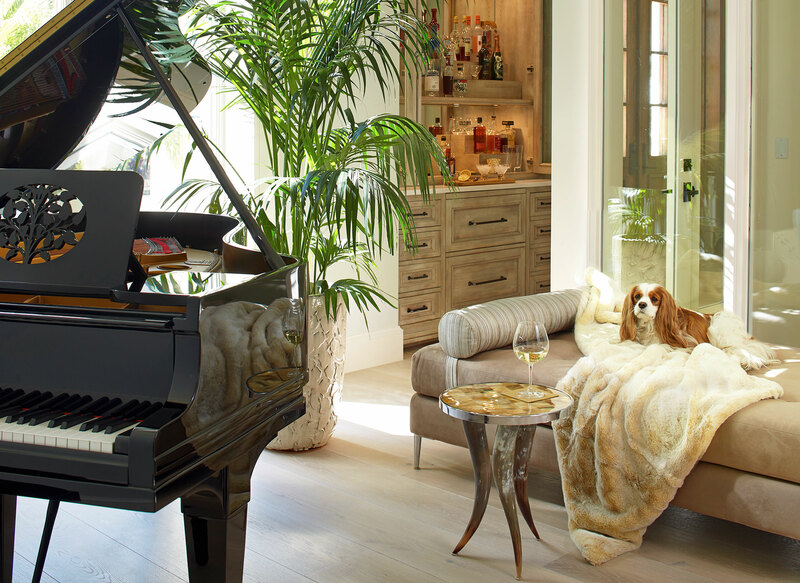 ABOVE: A gracious entertaining spot favored by Maggie, Sherman’s favorite design co-pilot. Calusa Bay’s breathtaking new homes have been attracting a lot of attention in Pelican Bay. Open houses produce numerous inquiries from prospective clients who would like the teams ‘magic touch’ applied to their own home. As a result, Calusa Bay Design has expanded to provide customized project management and interior design services to a limited number of outside clients. The goal is quality, not quantity, a mantra which Sherman has maintained throughout her career. Quality and creativity are clearly evident in every project, from the architectural design by Stofft Cooney Architects, to the unique finishes, to the stunning interior furnishings. ABOVE: Elegant design detail is highlighted against the night sky. Calusa Bay Design is currently working on a few select new construction projects in Pelican Bay. After previewing design plans for these homes, it’s evident that for Season 2017, Calusa Bay Design will once again Steal the Show. This function has been disabled for Calusa Bay Design.